These are our most popular mounts! The mounting clamp can be positioned horizonatally for horizontal mirror arms and rails, or vertically for vertical mirror arms or rails. The clamp may be omitted, allowing the angle bracket to be used as a side mount on any flat vertical surface. 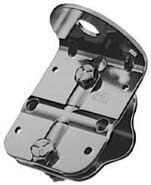 The mount is available in either stainless steel or chrome plated cold rolled steel. Both models come complete with mounting hardware (SS-6 includes stainless steel hardware). The actual size of the bracket is 2.25" (57mm) wide by 2.9" (74mm) high. With the stud in place, the over all height is 4.2" (107mm). Outward protrusion from the vertical surface 1.9" (48mm). With the supplied standard length bolts you can install it on a tube with a diameter up to 0.850" (22mm). If longer bolts are used, the maximum tube diameter is 1.5" (38mm).